What are the documents that should be included in your policy? What are the key factors to consider when acquiring an insurance policy? How do I learn more about my rights and duties? Your rights and the rights of your insurer are described in the general conditions document and specified in the policy schedule; you just need to know where to look. You also need to understand when and how to file for a claim, in the Claims Handling section. Where do I find the specifics about my benefits and premiums? The policy schedule shows the specifics of your benefits and the details of the premiums and premium payments. In some cases, particularly in life insurance policies, you may have riders added to your policy. Each rider has its own general conditions document or section, which needs to be included in the policy. The specifications of each rider should be clearly stipulated on the policy schedule. This includes the details of the benefits and premiums related to this rider. If you missed the payment of your insurance premium, you will probably still have coverage immediately or shortly after your payment was due. Typically, most insurance policies have a grace period of a certain number of days. Inquire about the grace period that your insurer offers you and negotiate terms of payment to avoid the cancellation of your policy. What taxes am I subject to when purchasing an insurance policy? Premiums related to life insurance covers are only subject to the fixed stamps. 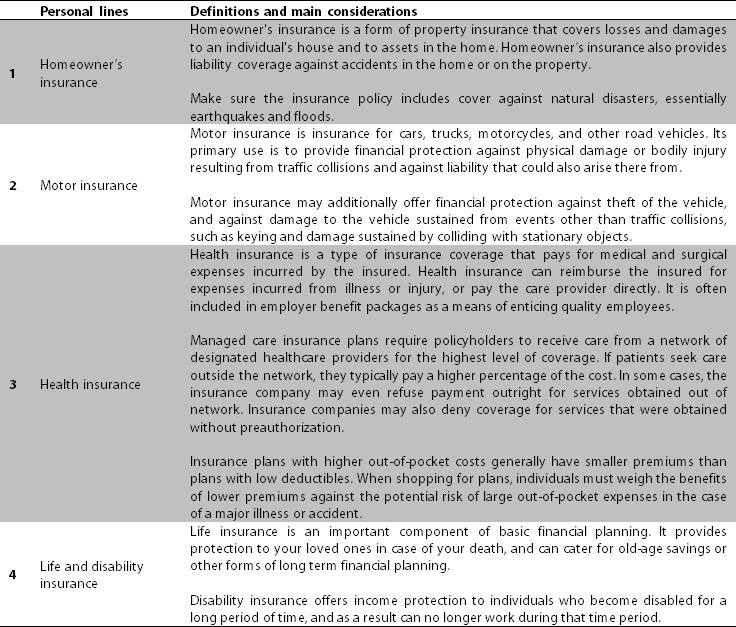 What is the definition of personal insurance? Personal insurance lines help protect individuals from potential losses they could not afford to cover on their own and makes it possible to do things like drive a car and own a home without risking financial hardship or ruin. What are the main covers in personal lines?